So I have 2010 SRAM Force on my lovely Cervelo for the last 6 months and I have loved every second of it. Ok well every second except for the loud clunk noise it makes. This last week has changed all that. Last Saturday while out, my shifter suddenly started making noises when I attempted to shift up and just plainly refused to shift up. This quickly turned into a stiff shifter and it jumping down gears everytime I tried to go to an easier gear. Not good. I limped home and took off the shifter cover to look for the problem. It became quickly visible. 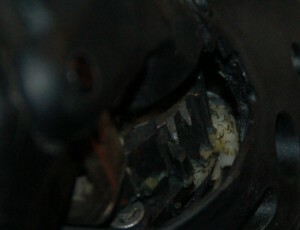 The little wheel inside the shifter was the problem, a tiny bit of carbon. Oh and it isn’t one of the spare parts. Luckily it should be covered under the warranty so I contacted the shop where I bought it to find out. 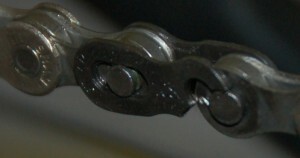 The Force groupset I had ordered back when I built the bike came with a PC-1030 chain. Since I already had 3 spare PC-1070 chains from a bulk order, I left it in a box to keep for my other bike. Well since Sunday was a day without real training, I decided to do some maintenance which also involved swapping the chain. Well wouldn’t you know it, but the chain was one of those funny ones with the weak powerlinks. 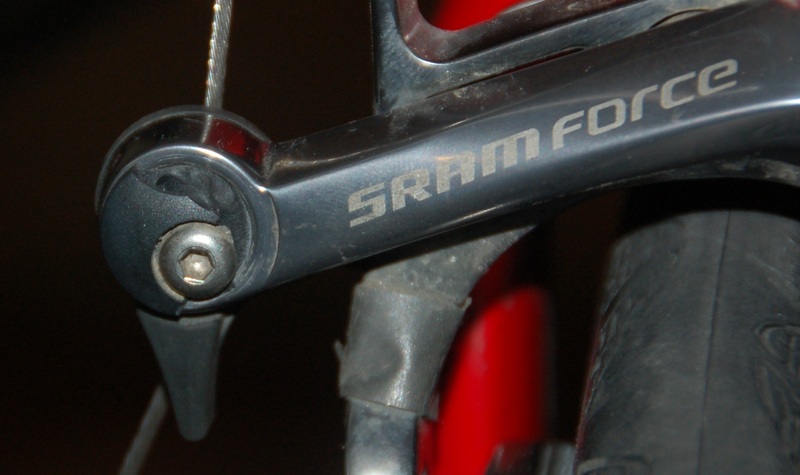 One SRAM also covered under a recall. Nice. If only it hadn’t broken on the damn chain. Lets set the scene. 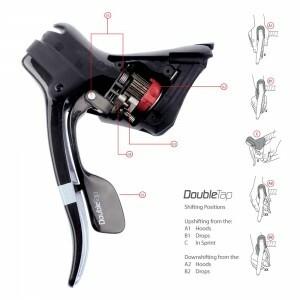 My new shifters had arrived. I had got them on the bike, threaded the cables, even adjusted the rear dérailleur. Now it was just do the brakes and the bike is ready to go. Brake cable goes inside the clamp, I adjust the brakes to where I want them. Put my torque wrench up and start twisting when pong, something goes flying. Immediately I start scanning my torque wrench thinking, crap I’ve broken my torque wrench. But no, the brake quick release housing has decided to give up. Firstly, the manual says tighten to 6-8nm. My torque wrench was set to 5nm. Yes I know it was light but I’d rather be safe on the initial setup of things, so I usually do a lower torque first then go back. Well in this case it didn’t matter. Thinking I was cursed I did a google and came across another blog which seems to reference the exact same issue, just without pictures. Well below are mine. I’ll update this when I talk to SRAM tomorrow. One problem I could understand. Getting really unlucky with the chain too, yeh ok these things happen. But three faulty parts, at least 2 of which SRAM know of, and the 3rd which I know of at least one other person who had the exact same fault, well I’m slightly peeved now. Edit 1: I’ve tried calling SRAM who directed me to the UK distributor, Fisher Outdoor. I have mailed the SRAM rep through them to try get some answers. Cosy Beehive has another post with more pictures of the brakes failing in the same way. Oh and a quote from an SRAM rep saying the brakes still work. Well yes the brakes do work, but what happens when the brakes fail because the rest of the plastic snaps off and the cable comes loose? More will follow. Edit 2: I spoke to someone in Fisher Outdoor who was very helpful. For problem 1, he confirmed he had seen this on a handful of shifters and that yes, it’ll be replaced under warranty. For problem 3, he confirmed that there is a batch of about 1000 units worldwide that has this problem. Given that I got mine in December 2009 and there are people who bought in the last month who are having this problem, I’d say the number is probably higher. However once again this is a warranty replacement. However I really don’t fancy buying another set of brake callipers while these go off to be replaced. I wish they’d just send out a replacement plastic piece. Oh well. Edit 3: My new shifter arrived last Friday from Fisher. They also included a full 1091 chain as a replacement for the broken power link. Honestly a lot more than I expected in that respect. Edit 4: It took some time, all due to me, but I got a new brake calliper from Fisher. The Quick Release plastic section is noticeably thicker than the previous model. I did also suffer another SRAM Shifter failure, this time the four pillar posts holding the gear shifter came apart. I knew this was already a known problem so the shifter went back and was also replaced. The new one is from a different batch so hopefully that is the end of the problems. It also shifts much smoother too. Even though I’ve had troubles, my dealings with Fisher have been one of the best RMA experiences I’ve had without anything really. I do like SRAM and bar building a long distance touring bike, I’ll be stick with SRAM. Knowing that if there is ever a problem, the fix is quick, simple, and painless, well that is something.